Ancien Anti-materialiste. Organe Mensuel de la Synthèse Scientifique, Sociale et Religieuse. 1886-1887 Monthly Editor: Rene Caillie. Stanislas de Guaita, Paul Roca, and other collaborators of the journal. In early 1887, Dramard withdrew his support and the magazine collapsed. Dramard then devoted his efforts to the new Le Lotus and the Isis branch of the Theosophical Society. He died in March 1888. 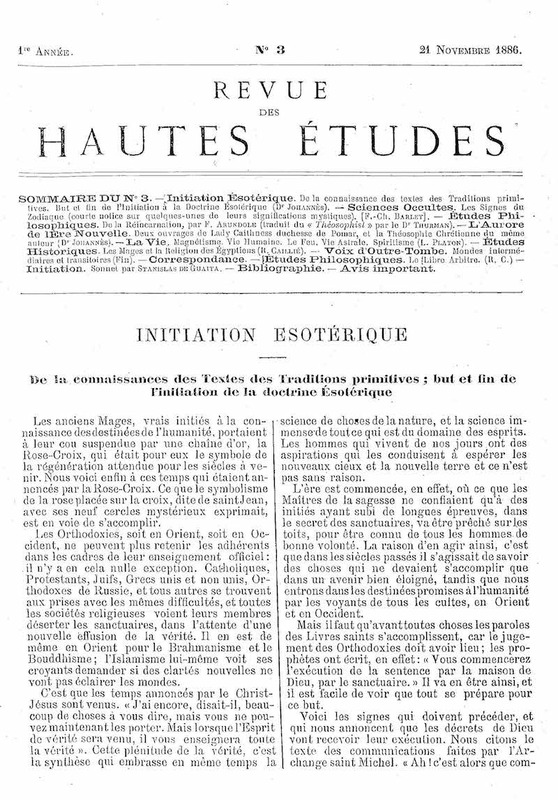 Caillie went on to co-found the Fraternite de l'etoile with its own journal, L'etoile, that attracted that section of French occultism (Stanislas de Guaita, V.-Em. Michelet, Jules Doinel, Abbe Paul Roca, et al.) which favored a "Western" approach to occultism and attributed a special (though scarcely orthodox) role to Christianity, and also edited L'Âme along the same lines. On all of this, see the notes under L'Anti-Materialiste, Le Lotus and L'Initiation. Not unrelated to this opposition to the "Eastern" or "neo-Buddhist" tendencies of the Theosophical Society is the fact that Dramard (along with F. Ch. Barlet) translated the secret teaching manuscripts of the H.B. of L. into French, and along with Caillie, Papus and others were (or were about to become) members of the H.B. of L. See the notes under The Occult Magazine and L'Initiation. BNF.